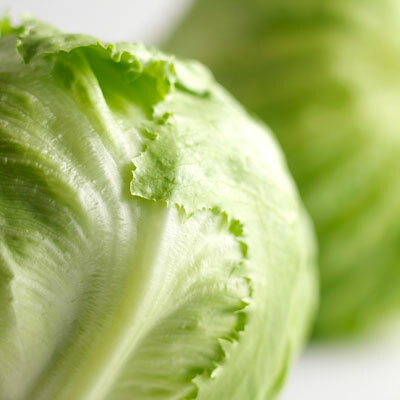 Iceberg lettuce has a crisp texture and a refreshing, mild flavor. Compared to darker-green lettuces, iceberg lettuce does not boast as many nutrients, but its unique, crunchy quality is unlike any other. Iceberg lettuce leaves can be torn off the head, chopped, cut into wedges, or shredded for salads, sandwiches, burgers, tacos and more! The iceberg's sturdy leaves make a great veggie wrap for a low carb alternative to bread. Choose a firm head with healthy outer leaves. Store lettuce in a plastic bag inside the refrigerator crisper. Always wash fresh produce before consuming.